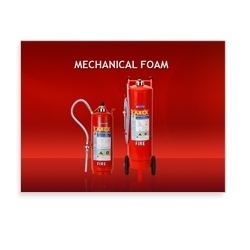 Our range of Mechanical foam fire extinguishers are available in various specifications and are suitable for fighting fire of Petrol, Oil, Paints, Spirits, Chemicals and Flammable liquids fires. These extinguishers work on ‘blanketing effect’. They effectively cut off atmospheric supply of oxygen to the burning surface by forming thick layer of foam over the burning surface. Thereby repress the fire and prevent re-ignition.